This is a really great compilation CD of mostly unreleased material covering the whole 10 years of the band. 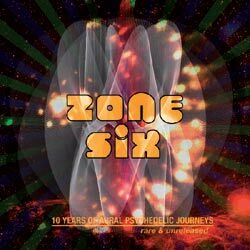 If you don’t know Zone Six, they are a German band which has featured members of Liquid Visions. Dave Schmidt has always been in the line up but others have come and gone. The CD starts with some unreleased material with their only singer ever, Jodi Barry. Tracks 1-2 were from the band’s 2nd jam session ever, while the 3rd is from one of the early gigs (1998) and although a raw recording it really captures the spirit of the band at this time. Knuf om Tog is from a short lived line up in 1999. Hidden World is taken from some sessions in 2003 that will be released in 2008. This track is quite spaced out and not very intense compared to what this line up has released before. The next two tracks were recorded at the DeadHead Meeting in Plauen in 2006. The CD ends with a really crazy track that you can hear if you own the limited CD-R release from the bands 2006 Burg Herzberg release. This is for sure a must for all Zone Six fans. A high quality selection of stuff.. One other bonus with this CD is that all 1000 copies have a unique front cover. You have to read about how they did it in the book but thank Kosmik Klaus!